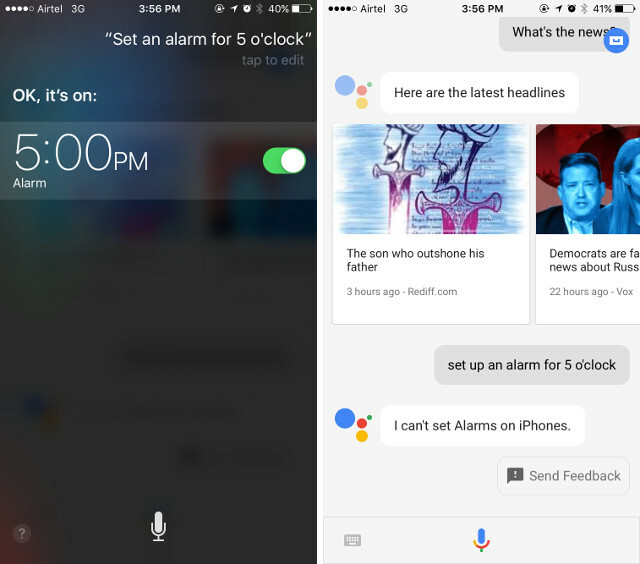 Home Mobile iPhone Google Assistant on iPhone vs Siri: Can Google Assistant Compete? 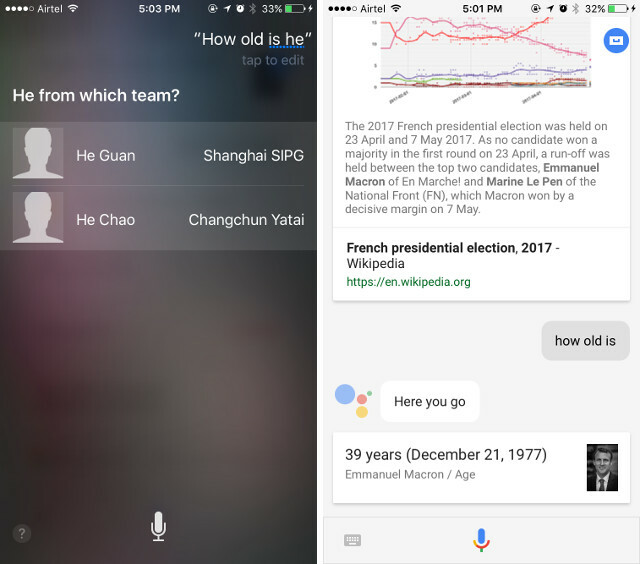 Google Assistant on iPhone vs Siri: Can Google Assistant Compete? The home turf advantage of Siri is more visible here than anywhere else. 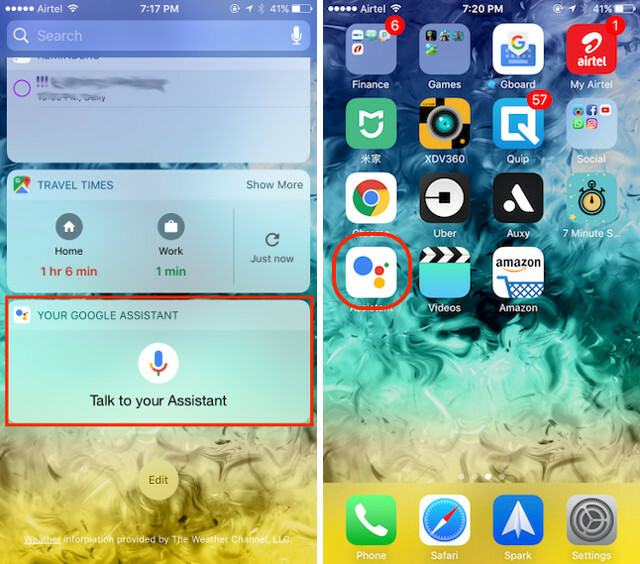 As it is baked right into the core of iOS, it can be launched just with a voice command (‘Hey Siri’) or by long pressing the home button.The closed system makes it harder for us to launch Google Assistant, fortunately there our a couple of ways we can access it. You can access it by launching its app or by using its widget in the notification center. There’s also a hack which you can use to launch the Google Assistant hands-free. But, you will have to use Siri for that. Just say, “Hey Siri, open assistant”, and it will open the Google Assistant. There is also one advantage that Google Assistant has over Siri. 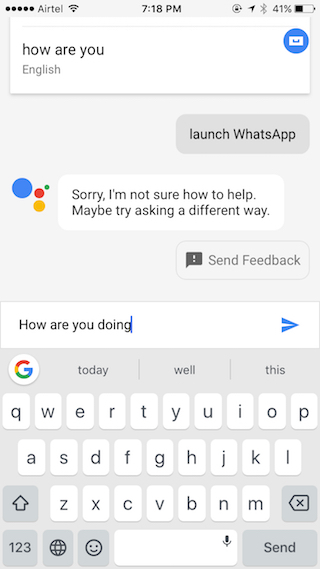 While Siri only allows you to speak to her, Google Assistant lets you use both voice and typing as an input. This makes it a lot easier to use in noisy conditions. Having said that, Siri is a lot more easier to trigger on the iPhone, thanks to its hotword command and its home button integration. Another home turf advantage Siri enjoys over Google Assistant is that it can interact with Apple’s own apps as well as third-party apps on iOS. For example, you can ask Siri to launch Uber or send a message via WhatsApp. 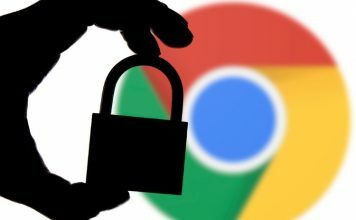 Apple does not allow Google to access that information and you will have no luck here. However, if you are an avid Google services user as I am, you will enjoy the fact that with Google Assistant, you can launch and perform actions on Google’s own apps such as Maps, YouTube, and Gmail. Imagine how good it will feel to get the directions directly on Google Maps rather than Apple Maps which is what Siri uses as a default. 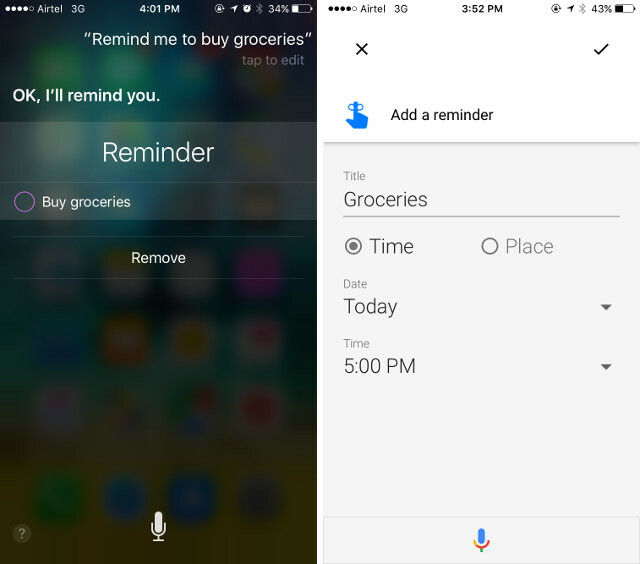 When it comes to setting reminders, both voice assistants performed the same. They were quick and recognized the instruction pretty clearly. 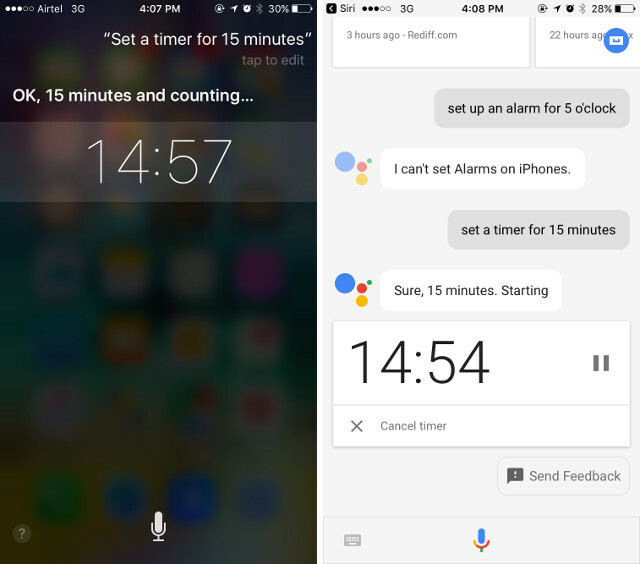 However, when it came to setting up an alarm, Google Assistant could not do it, as it could not access the clock app on the iPhone. Since it could not access the clock, I was sure that Google Assistant will not be able to set a countdown timer, but I was clearly wrong. As you can see, creating a calendar entry was equally easy for both of them. 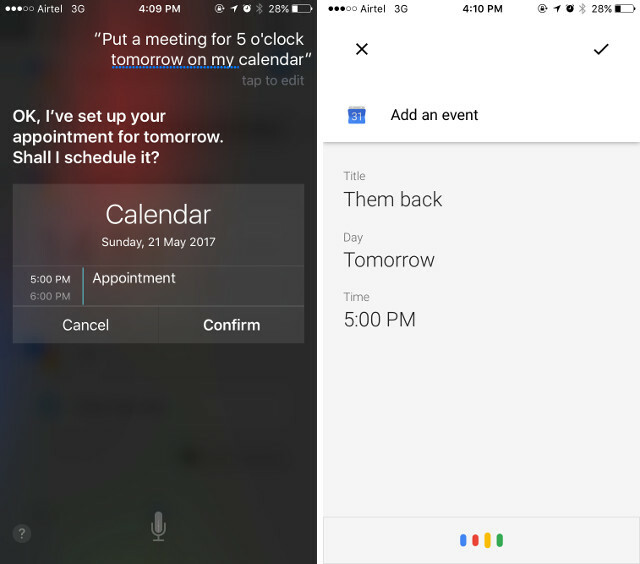 The only difference being that Siri used Apple’s own calendar app and Google Assistant using the Google Calendar. Siri’s integration helps it to win here. When asked Siri, it can directly call or send a message to the designated person. While Google Assistant can also perform these actions, it requires an extra step. It will ask for a confirmation before carrying out the task. 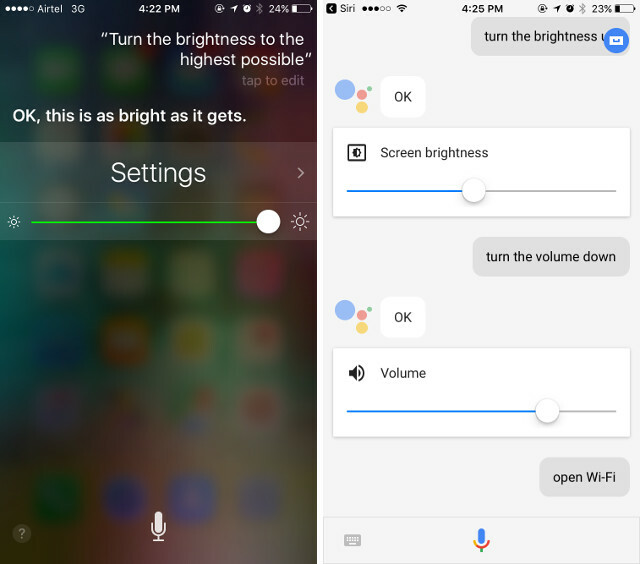 While Siri can easily help you control the brightness, volume or any other setting for that matter, Google Assistant seems to be a hit or miss here. 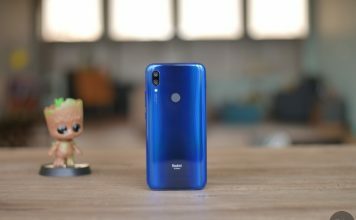 There are some settings like brightness and volume control which it can successfully to change. However, when I tried to change the WiFi and Bluetooth settings, it did not allow me to do so. Siri clearly performs better here. One of my favourite features of Google Assistant is that it can remember anything you tell it to. You do not have to set any reminders or take notes or anything. Just ask your Google Assistant to remember something and it will. However, when you try it with Siri, every time it will try to create a reminder for you. Google Assistant wins here. Google Assistant is pretty good at carrying out a long drawn conversation. It does not forget the context of the questions and remembers everything we have asked it in the past to give a context based answer. Siri has been lagging in recognizing context-based questions in the past, but might have improved by now. Let’s check. We start with a simple question which has been in news recently, “Who won the 2017 French Presidential Election?”. 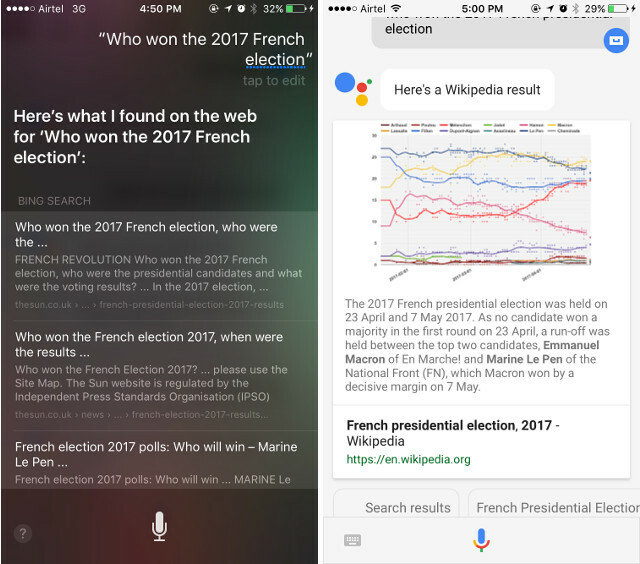 While the Google Assistant pulled off the Wikipedia page containing the information, Siri just gave links to a bunch of various websites through a Bing search. Since Google Assistant pulled information from Wikipedia and could not answer specifically, I did not expect it to rise to the challenge of my next question, “How old is he?”. I was more than surprised to see that it returned with the correct answer. Siri acted like Siri, and lost her whereabouts. It started giving results of random people whose name started with “He”. It was quite hilarious if you ask me. 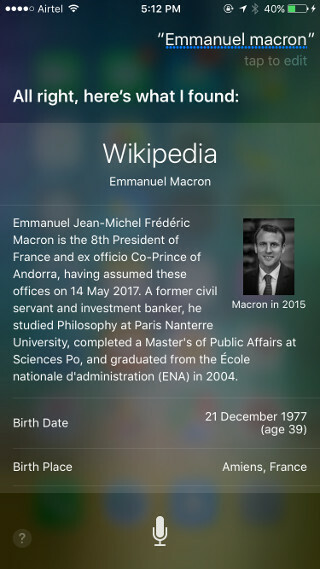 I asked Siri who “Emanuel Macron” was just to give her context for my next question. As expected, she returned with the right answer. 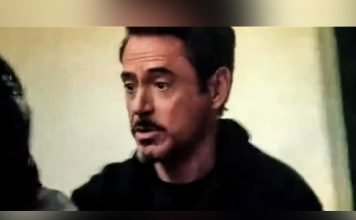 My next question to give Siri one more chance in this battle was very simple,”Where did he study?”. I asked Google Assistant the same question. 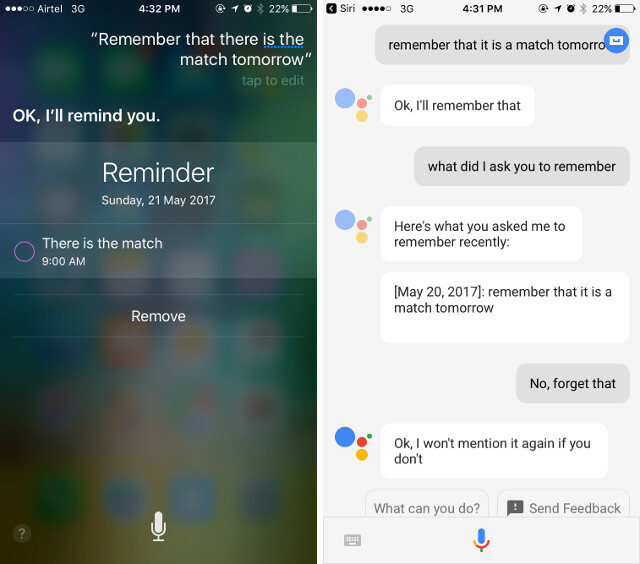 While Google Assistant still remembered in what context the question was asked, Siri went through a phase of amnesia and forgot everything. Siri hasn’t improved even a bit when it comes to context based conversation and Google Assistant wins this round even with its hands tied behind its back. Lastly, we wanted to check how good both assistants are with translations. We asked a pretty simple question, “Translate how are you to French”. Google Assistant returned with what was asked for and Siri showed her love for web pages again, giving us the links to different websites. Her results even included a link to the Google Translate. I guess we know who wins here. 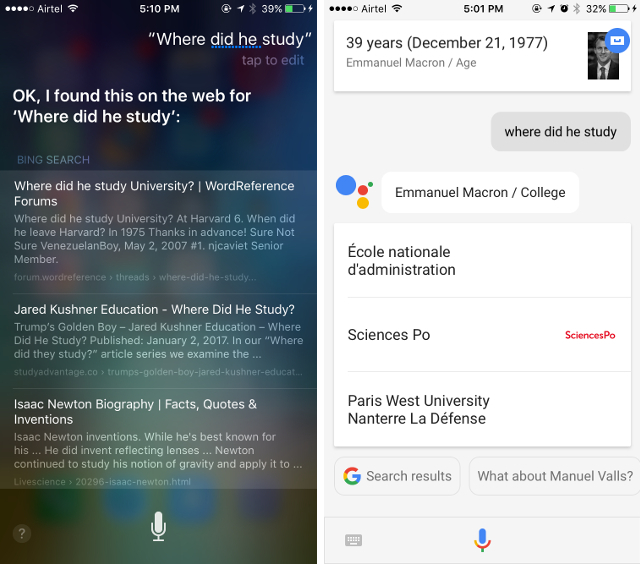 Google Assistant keeps it advantage over Siri when it comes to retrieving any information from the internet. It’s no surprise here as Google Assistant has the power of Google’s entire search engine and other tools behind it. It is far better when it comes to conversational questions and contextual recognition. It is obvious that when it comes to AI and smart assistance, Google Assistant is far superior to Siri. Where Siri beats the Google Assistant? 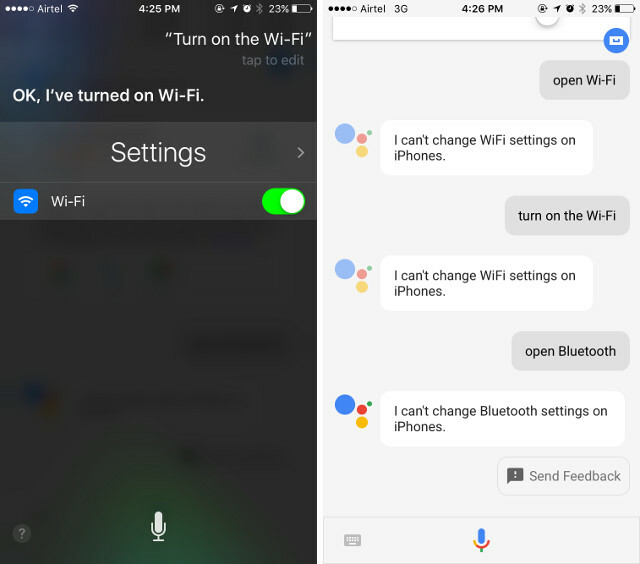 Siri beats its competition, including Google Assistant, on iPhone because of the closed nature of iOS platform. 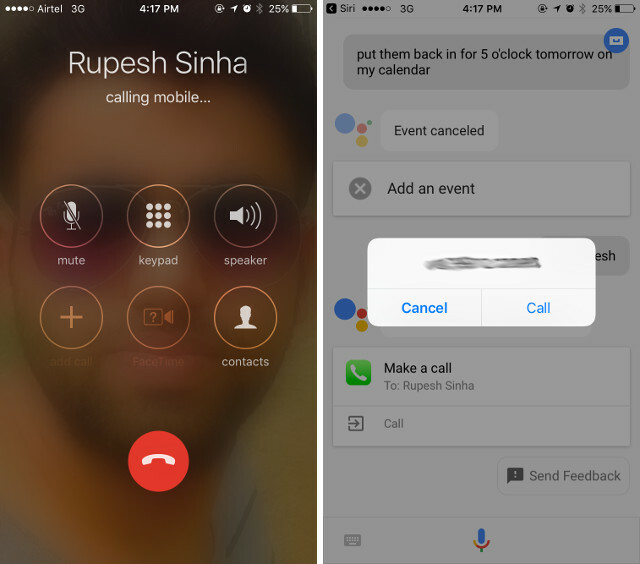 Since it is integrated right into iOS, it can launch apps, change settings, make calls and send messages. Siri is also easier to launch than Google Assistant. When it comes to interacting with the software present on the iPhone, Siri beats Google Assistant Hands down. Is Google Assistant Worth Using on iPhone? The answer is both ‘Yes’ and ‘No’, as it completely depends on your usage. If you use your voice assistant to interact with apps and settings on your phone, Siri is still the king on iPhone. 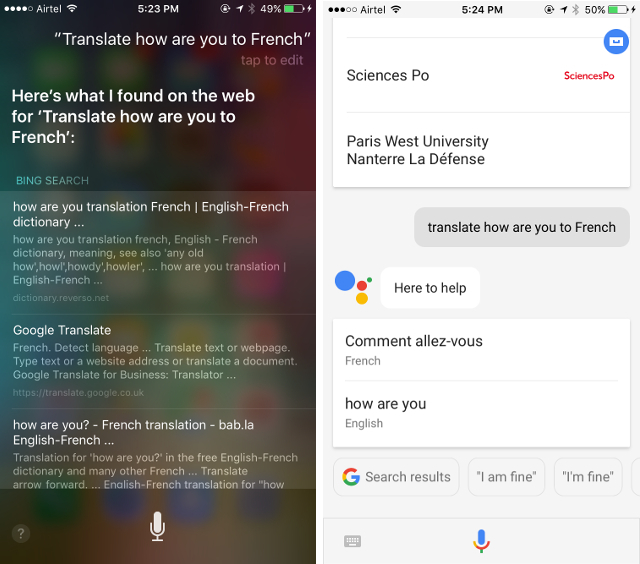 However, if you want to do anything else, like retrieving information from the web, asking a contextual question, translating into different languages, basically anything a voice-powered AI is supposed to do, you are better in the hands of Google Assistant. Well, those were my thoughts but what about you? 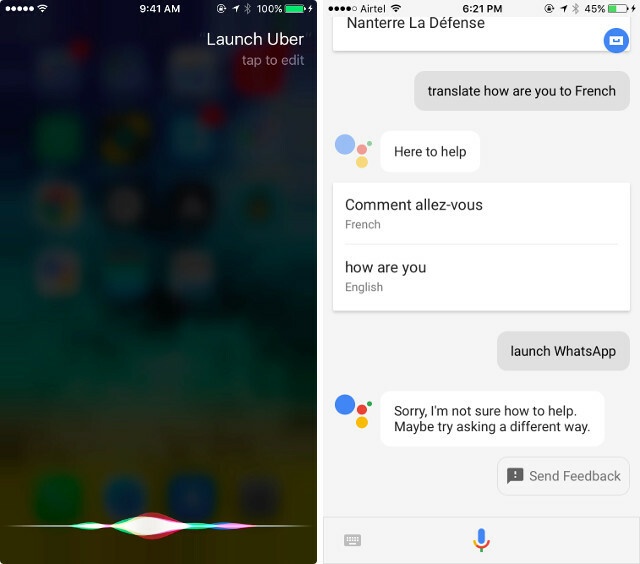 Will you be using the Google Assistant or Siri on the iPhone? Let me know your thoughts in the comments section below.